Three fires sparked in northern Tel Aviv from gas tank explosion leaving 4 injured, forcing evacuation of residential buildings. Three fires broke out today in apartments on Almagor and Rama streets in northern Tel Aviv Sunday following a gas tank explosion. Four people were treated for injuries resulting from smoke inhalation. Five firefighting teams are working at the scene to control the blazes. 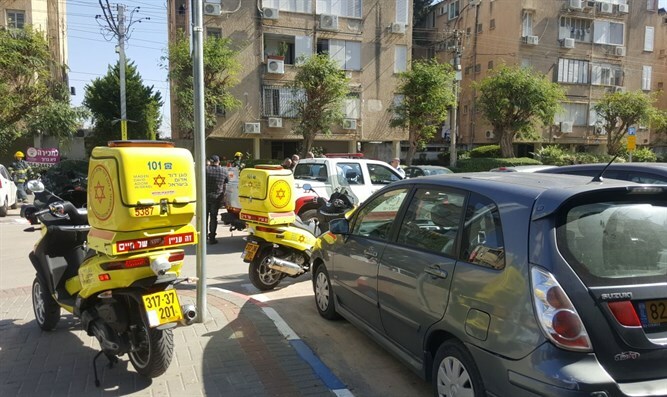 MDA paramedics evacuated a 60-year-old man who was lightly injured by smoke inhalation to Ichilov Hospital, and three others who suffered smoke inhalation treated by the teams did not require evacuation. "I was at work when I heard a loud explosion, then saw smoke coming from a nearby building," said MDA medic Aviv Katz. "I immediately drove to the place on a MDA motorcycle. When I arrived I joined other MDA forces and large police and firefighter contingents who came to the scene. During firefighting operations, we conducted a search for casualties and provided medical treatment to two men of about 60 who were lightly injured and suffering from smoke inhalation." An initial examination suggests this is not a criminal incident, police said. At this stage the investigation continues, focusing on the possibilities of negligence or technical malfunction.